There is an article kicking around the blogosphere about hardship posts in third world countries and the corresponding allowances that Foreign Service employees get. I'm not going to go up in arms; most people see the % and have no real context except that this is an extra bump up in pay. I'd like to use this as an opportunity to explain what this means in real terms. I'm going to give you and example, then you can go ahead and make up your mind whether this is really an unreasonable expense on the part of the government. This is not a big secret. Really. You can click here and see allowances by type. You can click here and see the allowances by location. Go ahead, I'll wait. Done? 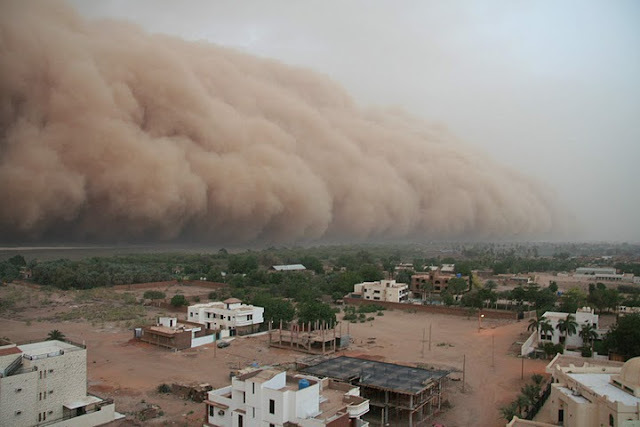 I'd like to point out that that 25% hardship differential for Khartoum is partly for willingly ingesting fine dust particles (between 0.5 and 10 micrometres) in the Sudan (please see photo below). I mean, really – where can you hide from that kind of dust that gets into everything? Everything. Short of shrink-wrapping yourself, there is no escape. They are yellowish brown with a dash of nastiness. Did I say they are really fine? I supposed any well-intentioned taxpayer can go to Sudan for a year, during harmattan and personally investigate if this health hazard is really worth that 25% bump in government employees’ pay. And if it's not clear the first trip, one should do a second trip and stay a year to see if the lungs like it better; perhaps even spend a third year, just to be sure. Don't like to go to Sudan? There are other posts available that are not in the war zones. You might try any of the posts in China. The great historical city of Beijing is on the list. The last time I look, the USG was able to bump it down to 15% differential because the air is now better for your lungs. As to danger pay, that's an allowance for being a moving target overseas. But it would look bad if we start calling it the "moving target" allowance, right? You may or may not know this but more ambassadors have died in the service of this country in the last 30 years than generals. You can look it up in the AFSA memorial plaque. As unarmed representatives of the United States, our diplomats and their families put themselves in harm's way overseas simply because of who they are and where they work. I wrote about this piece of crap here:http://lifeafterjerusalem.blogspot.com/2010/03/response-to-utter-bs-about-fs-life.html ...I tried not to but I couldn't help myself. What a load of BS this guy spews (I included a link to his original post only because the comments from our colleagues were great. I don't think the pay is enough. It is absolutely mind-boggling that people CHOOSE this life, and force it on their kids too. For some reason, we actually love it - the chance to travel, learn about new cultures, we love that our kids are learning about new nations, etc. but when you consider the cons as well as the pros... well, it's a wonder that anyone ever volunteers. I am glad that commentors for that article were so quick to uncover the history of the author. A loser with sour grapes.